The long-awaited Blu-ray debut of the Coen Brothers’ comedic hit The Big Lebowski is finally arriving this summer when Universal releases The Big Lebowski Limited Edition Blu-ray on August 16, 2011.The release arrives with all-new bonus features, digital copy, and collectible hardcover packaging for its 1.85:1 high definition transfer. Audio will be English DTS-HD Master Audio 5.1, French (EU) DTS Surround 5.1, English Dolby Digital 2.0/2.0 DTS Express, and English SDH, Spanish, and French subtitles. NOW ON BLU-RAY™ FOR THE FIRST TIME EVER! (True Grit, Fargo) and starring Academy Award® winner Jeff Bridges (True Grit, Crazy Heart), this acclaimed comedy has been newly remastered in high definition to provide longtime fans and first-time viewers alike with the ultimate Lebowski experience. Jeff Dowd – the real-life inspiration for The Dude – Jeff Bridges’ personal, on-set photography, a film timeline, trivia and much more, The Big Lebowski Limited Edition Blu-ray™ is a must-own addition to any collection. 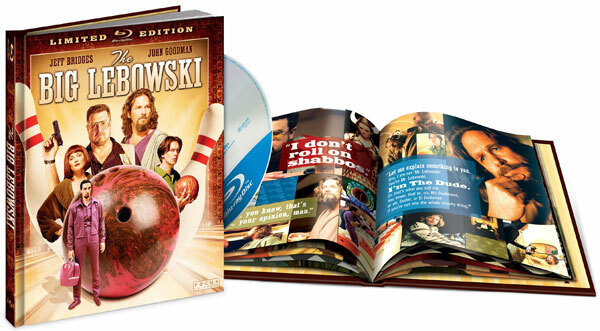 In addition to all-new features exclusive to the Blu-ray™ release, The Big Lebowski Limited Edition Blu-ray™ also offers a digital copy of the film that can be viewed anywhere at any time on the consumers’ choice of devices including laptops, tablets, smartphones as well as Internet-connected TVs and set-top boxes. Its now iconic characters and instantly recognizable dialogue have made The Big Lebowski “the number-one cult film of all time,” according to The Boston Globe. Since its release, the Coen Brothers’ affectionately addled riff on film noir has snowballed in popularity, becoming “an undeniable pop-cult force” and even, for many, “a way of life,” in the words of the Los Angeles Times. “A masterpiece of anti-storytelling” according to Entertainment Weekly, The Big Lebowski has become a cultural touchstone for fans around the world. Starring Bridges as the film’s delightfully unlikely hero, “The Dude,” the hilariously twisted comedy thriller also features unforgettable performances by an all-star cast including Golden Globe® winner John Goodman (“Roseanne”), four-time Oscar® nominee Julianne Moore (The Kids are Alright), Golden Globe® winner Steve Buscemi (“Boardwalk Empire”), Oscar® winner Phillip Seymour Hoffman (Doubt) and Golden Globe® nominee John Turturro (O Brother, Where Art Thou?). U-CONTROL: Universal’s exclusive feature that lets the viewer access bonus materials without leaving the movie! Scene Companion: Watch cast and crew interviews, behind the scenes footage and more during key scenes with this picture-in-picture companion. Mark it Dude: This onscreen counter really ties the film together. Keep track of all the “F-Bombs,” “Dudes,” and “Dude-isms” in the film with this ultimate fan guide. The Music of The Big Lebowski: Instantly identify the songs heard while watching the film, create a custom playlist of your favorites and even purchase them from iTunes®! WORTHY ADVERSARIES: WHAT’S MY LINE TRIVIA: Test your Lebowski knowledge by finishing lines of dialogue during the film. Play as Walter or The Dude or in two-player mode against friends. BD-LIVETM: Access the BD-Live™ Center through your Internet-connected player to watch the latest trailers and more. JEFF BRIDGES PHOTO BOOK: For more than 30 years, Jeff Bridges has been snapping pictures on movie sets. The accomplished photographer presents exclusive shots taken on the set of The Big Lebowski providing personal commentary on each photo. THE DUDE’S LIFE: Jeff Bridges, John Goodman, Julianne Moore, Steve Buscemi and John Turturro take a look back at their performances and their delivery of the Coen Brothers’ dialogue that became classic movie lines. THE DUDE ABIDES: THE BIG LEBOWSKI TEN YEARS LATER: A freewheeling conversation with the cast about the film’s decade-long reign as a cult classic, including a discussion about what ever happened to the “little Lebowski” that the Dude and Maude made that fateful night! THE LEBOWSKI FEST: AN ACHIEVER’S STORY: An in-depth look at the popular Lebowski Festival, formed by the legion of fans in honor of the film. THE DUDE: From aerial flights over Los Angeles with his bowling ball chasing Maude on a flying carpet, to the large scale “Busby Berkley” dance sequences as The Dude goes flying through the legs of all the bowling pin headed dancers, this piece examines how these “ahead of their time” scenes were constructed. THE MAKING OF THE BIG LEBOWSKI: A behind the scenes look featuring interviews with the Coen Brothers. PHOTO GALLERY: Slideshow of Jeff Bridges’ on-set photography. AN INTRODUCTION: Featuring Mortimer Young, a practitioner of “non-uptight” film preservation. His restoration of the famous “toe scene” will blow your mind.